Most afternoons when I make my way to the clubhouse to get interviews that I need, it’s inevitable that I will pass two specific players first. Sitting in a chair on top of one of the old picnic tables is Ariel Jurado. To Jurado’s right in another chair is fellow pitcher Yohander Mendez. 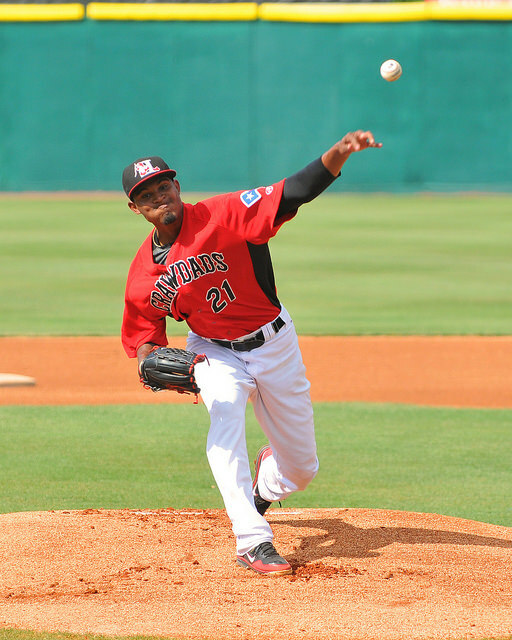 It seems fitting that the two are nearly inseparable as they have become a deadly 1-2 punch on the mound in a piggyback arrangement for the Hickory Crawdads during the second half of the season. 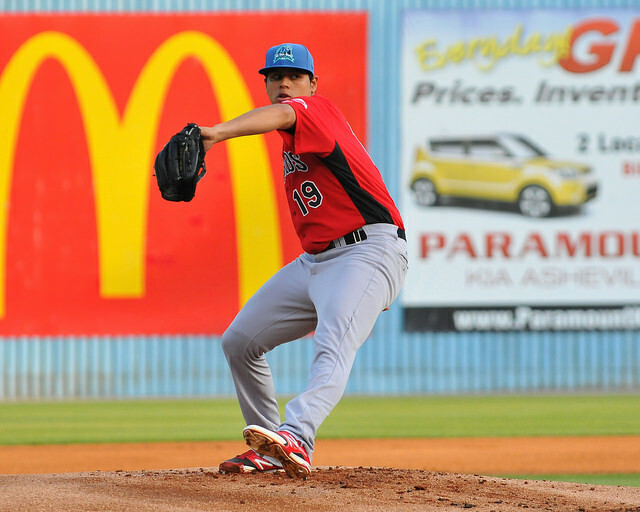 Jurado, the right-hander, signed with the Texas Rangers as a free agent in 2012 out of Aguadulce, Panama. 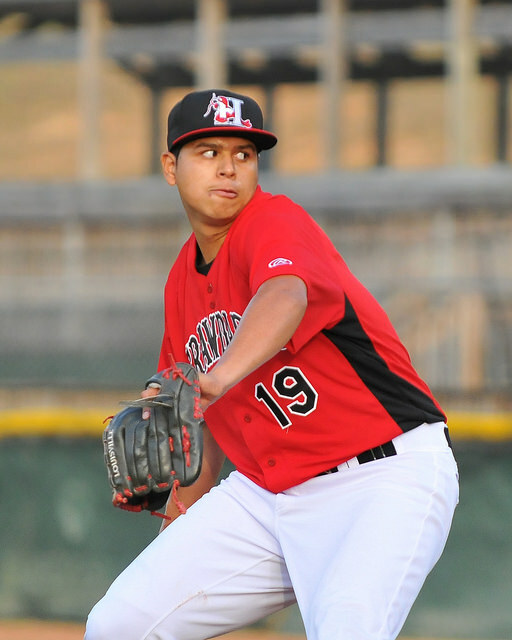 Through August 7, Jurado was 11-0 with a 2.21 ERA. He’s shown excellent control with 77 strikeouts and ten walks over 81.1 innings. The 19-year-old earned the start in the South Atlantic League’s All-Star Game is currently ranked by mlb.com as the Rangers’ 19th– best prospect. A change to a three-quarter arm slot has given Jurado a sinker that one scout said had Kevin Brown qualities. Jurado can use a change up for strikeouts, as well as a slider. He has begun to develop a curveball this season which Jurado has shown a good feel for the pitch. Mendez throws a fastball that ranges generally 89-91 mph, but has touched as high as 95. His main secondary pitches are a looping curveball and a change up that with good arm action induces missed bats from hitters. The two entered the tandem for different reasons: to limit Jurado’s innings – he has already surpassed his career high in innings – and to increase Mendez’s. However, it has also given both hurlers a chance to experience relieving and starting, something that pitching coach Oscar Marin said will serve them well later in their careers. I talked with both pitchers during the last home stand with the translation help of Marin for both pitchers. Marin also interjected with some of his insights for both pitchers. First of all, how have the two of you taken to the tandem? How have you adjusted to that? Mendez: One of the things we came together on was having the same routine. We’ve actually built a very good routine for both of us that works, very similar to what we had already done. The reason why we stay so sharp in what we have to do is we don’t think about whether we are going to relieve or going to start. The whole focus is on going out there and competing and getting people out. The routine itself doesn’t change and we want it that way. Ariel, you started and had a very good first half of the season. Has it been hard to pull back to just throwing two, three, four innings? Jurado: Obviously, the routine stayed the same, but the hardest part of doing what I have to do is having to reel back. Not reeling in the way where I am going to slow stuff up or I’m going to turn it on. It’s a different mentality going in to start and knowing I’m going to get deeper into the game rather than just going those three innings. Yohander, you were injured a lot last year. How have you adjusted going through a full season and staying healthy? What have you been able to do to stay healthy? Mendez: The biggest thing is working as hard as I possibly can physically and mentally also. The biggest thing that has helped me get through this year and the reason I’ve been doing what I’ve been doing is because of the routine I learned after I got hurt last year. Doing my leg work, doing my dumb bell work, doing all the elbow and shoulder stuff I applied to my routine last year. I just keep doing that now. Now, it’s part of the routine I’m always going to have and I’m lucky that I learned it last year. Yohander, are you throwing the change up more now than I remember seeing? Mendez: It’s just a different thing I have to do going from the bullpen to the rotation. Obviously, I have to use that change up a lot more and that’s pretty much the biggest change coming from the bullpen. Before, I’d go to the spinner right away because I was coming in with runners in scoring position and I’m trying to get that out and trying to get that swing-and-miss. Now, it’s a little different. I’m starting to use my fastball and change up a little bit more than I would my curveball. Ariel, when you are going shorter, do you feel like you have more in the tank at the end of three innings? Do you go harder in your three innings? Are you pacing yourself? Jurado (laughing): The answer is yes. I feel like I’ve got more in the tank. I know that my arm has to stay healthy. But because of how my arm feels, my stuff has been going up in velocity. Marin: That’s something that we’ve talked about before. We joke around with it because the harder he throws, the less movement he has. It’s one of those things that from a starting standpoint, he goes in there and works himself into what he’s doing, as opposed to going in there and he knows, “All right, I’ve got a lot in the tank. We’ve got three innings. Let’s go.” He does have more, but that’s been one of the things he’s been working on is maintaining the consistency of what he does with his arm speed. When I talked to Danny Clark (Rangers minor league pitching coordinator), one of the things he talked about was giving you (Ariel) challenges to where you are not bored. What are some of those different challenges that you are working through? Do you get bored just pitching three innings? Jurado: I’m taking the challenges well just because I do know that maybe going up into the higher levels possibly, if God willing I get to the big leagues, there is that possibility that I don’t come in as a starter right off the bat. So, I’m going to be in different roles. That’s how I’m taking it now. Maybe I’m not in the rotation, but going out of the bullpen. I’m trying to take those challenges and trying to do those to the best of my ability because you never know where you’re going to be in this game. When I walk down here to the clubhouse, I notice you two are sitting out here together. Have you two become good friends out of this? Mendez: That’s one of the things that goes along with piggybacking together and throwing on the same day. We’ve always been good friends, but the biggest thing about why we hang out together is we talk about the lineup. We talk about the hitters and what they’re doing. Marin: Yohander, being the older guy and kind of being around, he’s pretty much letting Jurado know to pay attention to the game and know what’s going on with the hitters and what they’re doing and what they’re not doing, because that’s going to give you a better idea of how you need to pitch to them. They kind of share and help each other out with the pitches when they play catch. What they’re seeing, what they’re not seeing. They kind of hold each other accountable. That’s one thing we’ve liked from both of these guys. They haven’t taken this thing as, “Alright, we’re covering each other’s inning.” They’re taking it as, “We’re going help each other out to get to where we need to get.” It’s fun to see from both of these guys. Ariel, one of the things that both Oscar and Danny both talked about is dropping your arm slot for the sinker this year. How did you come about that in the offseason and develop that? Jurado: Everything kind of started with a little tweak of the elbow. I had a little small injury. It was nothing major, but I got a couple of days off. When I was in Arizona, one of the things that Brian Shouse (Rangers complex pitching coach) saw was that every time I did a PFP play, my arm slot was at a low three-quarter. So, then he asked me after the injury, just to keep me healthy, “Can you throw from that slot off the mound?” And I did. At the time, it was just a four-seamer with some run. It went well that year. Over the break, I went to the Dominican instructs and the pitching coach there Henderson Lugo goes, “Have you tried using a two-seam from that slot?” I go, “No, I haven’t tried it yet.” That’s where it came from. Every since then, I’ve been using it and I’ve been perfecting it. Yohander, what is the biggest thing you have to work on between now and then time you hopefully get to the big leagues? Mendez: The biggest thing I need to work on is my physical appearance – my weight, my strength. It’s coming along and has gotten better, which is one of the reasons why I am where I am right now – maintaining that along with my pitches. The reason I feel really good about my pitches is because I feel strong. So, I want to continue to maintain that. Jurado: I still feel like I can get into better shape and still continue to have that repeatable delivery. Marin: He brought up his fastball to a certain side of the plate, which is fine. He also said, “I need to work on my sinker to the outside corner to a lefty.” I go, “Ok, that’s good. What about your fastball, your sinker to the outside corner (to RH hitters) so you can run that in?” It’s a sinker to both sides of the plate, not just one. He does a good job of throwing the sinker for a strike. He does a good job of throwing the sinker arm side very well when he wants. Can he start it out of the zone and have it come back in? That, I think, is the biggest thing he’s going to have to go from there. What do you think it is going to be like to get to the big leagues? Mendez: I imagine myself getting kind of something unexpected, in my mind. Getting a high level of happiness and emotion. It’s something that will be unbelievable. What’s the biggest thing you’ve gone through so far that you might later say that was worth it? Mendez: The year that I’m going to remember is the time I spent in the Dominican Republic. Pitching wise, it went fine, but emotionally being a new guy going into the organization, the attitude, that wasn’t completely where I wanted to be. Looking back, I made the adjustment and I’m happy I was there and turned the corner there. It helped me do what I am doing now. Marin: He’s absolutely right. His routine, his attitude, his stuff in the clubhouse, being a good teammate, he’s great at it. That’s one of the reasons he said that. He learned how to do that over there because he wasn’t so good at that early on. Jurado: The biggest thing was one of my countrymen, in the Dominican, was from Aguadulce in Panama. I came in not as a high-profile guy, but one of the things the strength coach there told me was, “Work hard, keep moving forward; you have to win yourself a spot.” So, he never let me go out by the wayside. He always pushed me to strive to be better than I thought I could possibly be. That’s one of the things I always keep in mind and keep close to my heart was that he pushed me to get to where I am at now.